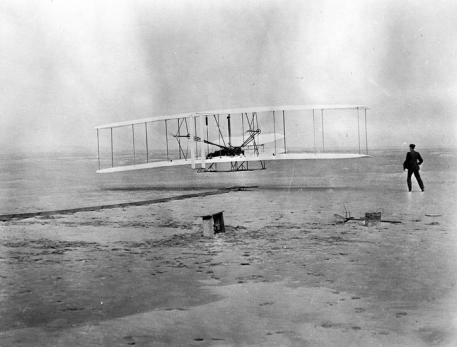 On December 17, 1903, Orville and Wilbur Wright made their first successful powered flight in a heavier-than-air craft. The story of the Wright brothers began in Dayton, Ohio, where they owned and operated a bicycle store. Seasonal slumps in sales forced the brothers to expand, and they decided to try designing a self-propelled aircraft. After six years of studying the principles of flight, the Wright brothers developed several prototypes, some gliders and others self-propelled, and began looking for proving grounds along the east coast. Their search ultimately led them to Dare County’s Kill Devil Hills, where strong winds provided lift and sandy grounds increased chances of a safe landing. After months of setbacks and unsuccessful attempts, at 10:53 on the morning of December 17 the Wright Flyer, under its own power, defied gravity for twelve seconds, clearing a distance of one hundred feet. Twenty-nine years later, in 1932, the State of North Carolina erected a monument at Kill Devil Hills, where the historic flight took place. Orville Wright was the guest of honor at the ceremony.